Kent told me a while back about this day trip he was planning to take with Bill. 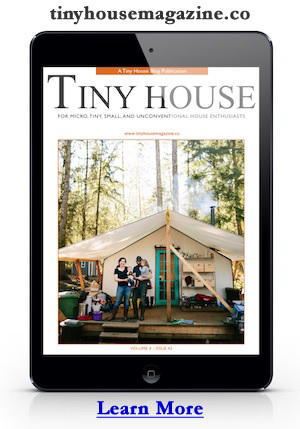 Kent Griswold runs TinyHouseBlog.com and Bill Kastrinos owns Tortoise Shell Home, a tiny house company in Sonoma County, California. I must admit I am a bit jealous but happy to hear about the trip from Kent today by phone and now see the photos online. Kent got so many photos of the delivery he’ll post the story in a couple segments to cover the whole day. The back story is that there is a group of people that live in the coastal mountain range west of the Silicon Valley just south of San Francisco. The area is extremely expensive to live in due to all the technology money. If you search the area using Zillow.com you’ll find few homes in the hills under a million dollars. But these folks did something pretty smart. They got together and bought a piece of property with an existing large home and then bought 8 tiny houses from Bill. Much of this story has already been told by Bill at the Tiny House Society Yahoo Group and Kent will fill us in on the rest of the story in his next post on the trip. So I won’t go into too much detail now. But the short version is… Bill has been building and delivering tiny houses to this community one at a time. The drive is usually a couple hours drive down highway 101 depending on traffic, although Kent shared with me that it was an all day affair and took them about five hours to get there. Yesterday’s trip was number 7 of 8 so Bill will make at least one more trip with one more house. The folks that ordered these tiny houses value their privacy but I’m hoping they will share how they did it. This is a great example of a tiny house village actually being built right in the middle of an area tightly controlled by zoning rules. If we could learn how they did it, a lot of doors might open for a lot of people hoping to do the same thing. Photo credit Kent Griswold. This entry was posted in Just For Fun and tagged Bill Kastrinos, buddhist, Kent Griswold, tinies, tiny house, tiny houses, tinys, Tortoise Shell, Tortoise Shell home.